Whether you are looking to host your group’s next golf outing with us, or wish to play in one of our in-house events, Riviera Country Club is the perfect place to play! Let our staff help you with all of the details of your special event. Our Food and Beverage Manager, Greg Nations will help to plan your memorable occasion. We take pride in maintaining beautiful course conditions, friendly service, and attention to detail for every event. 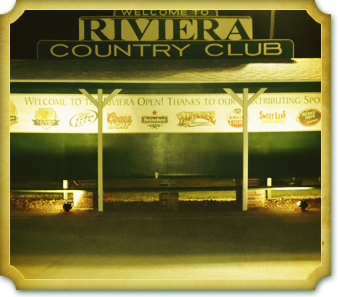 We are proud to be home to the longest-running Mini-Tour Event in the country, The Riviera Open as well as several local charity events each year. Please contact our staff to start planning your golf outing, banquet, or private party. No detail is too small, and we would be proud to share a part in your special day. Call our office at 386-333-9534 from 6:30am-6:30pm any day of the week to get started.